"Ganggangsullae is a seasonal harvest and fertility ritual popular in the south-western part of the Republic of Korea, performed primarily on Korea’s Thanksgiving in the eighth lunar month. Under a bright full moon, dozens of young, unmarried village women gather in a circle, join hands and sing and dance all night under the direction of a lead singer. During interludes, the women playfully mime vignettes reflecting life in a farm or fishing village, including treading on roof tiles, unrolling a mat, catching a mouse or tying herrings. The dance takes its name from the refrain repeated after each verse, although the exact meaning of the word is unknown. Once a rare break from restrictive rules governing the behaviour of rural young women who were not allowed to sing aloud or go out at night, except during the Chuseok Thanksgiving celebration, the ritual is mostly preserved today by middle-aged women in cities and taught as part of the music curriculum of elementary schools. 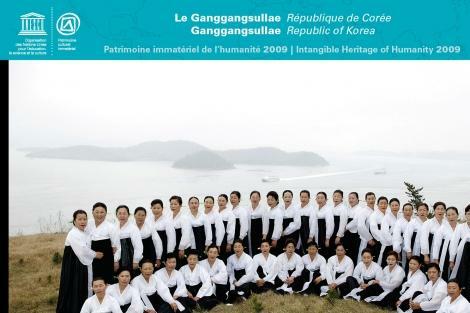 Now practised as a performing art throughout Korea, it can be seen as a representative Korean folk art. It is an important hereditary custom drawn from the rice culture that pervaded daily life in the countryside. The easy tunes and movements can be learned quickly for this communal practice that contributes to harmony, equality and friendship among the women dancers. Production: Cultural Heritage Administration, producer.